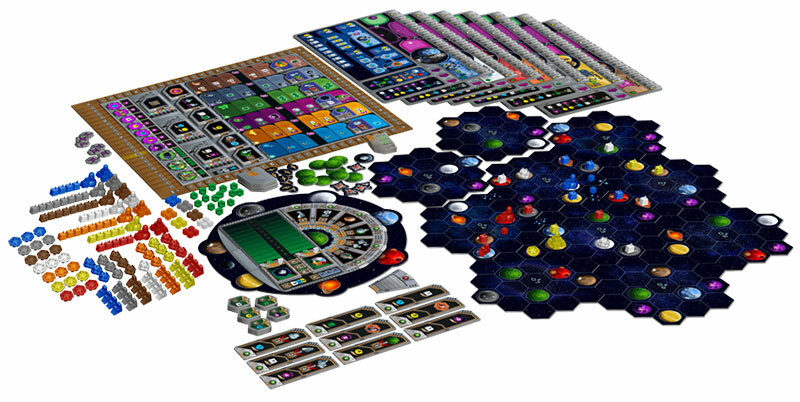 In Gaia Project , each player controls one of 14 factions striving to peacefully colonize the Terra Mystica galaxy. Each faction has different environmental needs to survive on a planet. These needs have led the factions to master terraforming, enabling them to make different planet types habitable for themselves. 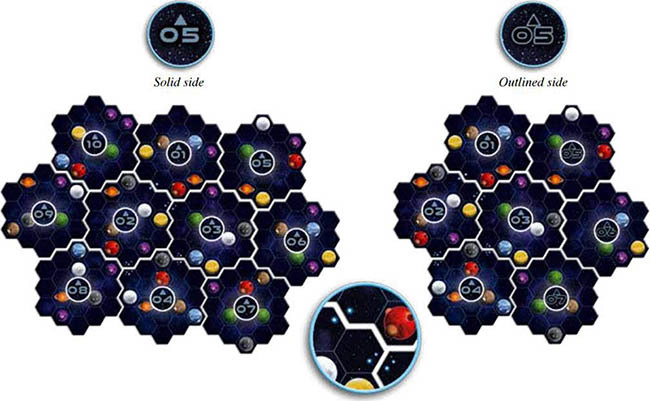 During the game, you will colonize new planets, upgrade mines into better structures, and unite planets to form federations. The choice is yours: will you expand near other factions, which might give you power and trade partners, or will you look for solitude, where you can expand more freely? In addition, you will need to research and discover new technologies to improve your skills. In the end, only the best developed faction will win. 7 double-sided Faction Boards Each side shows a different faction. For your first game, play with the following game board setup and factions. For future games, also use the Advanced Setup, which features a variable game board and all factions. Determine a first player using the method of your choice. That player takes the first player marker. Assemble the game board by taking all 10 sector tiles and placing them as shown below. Make sure that sector tiles 05, 06, and 07 are solid-side up. 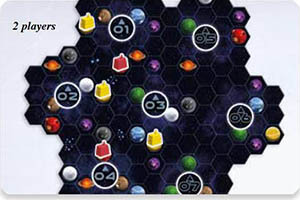 Assemble the game board by taking sector tiles 01 to 07 and placing them as shown below. Make sure that sector tiles 05, 06, and 07 are outlined-side up. Return the unused sector tiles to the box. Place the research board next to the game board. Take the nine standard tech tiles with green marks on the back and randomly place each of them faceup on a different tech space of the research board. Then stack the remaining standard tech tiles on the placed tiles of the same type; this will give you nine piles of four identical tech tiles. Randomly place one advanced tech tile faceup on each space between level 4 and 5 of the six research areas. Return the unused advanced tech tiles to the box. Set aside the federation token shown to the right; this is the Gleens faction's federation token. Randomly take one federation token from those remaining and place it on level 5 of the "Terraforming" research area. Sort and stack the remaining federation tokens by type and place these six piles next to the game board with their green sides faceup. Exception: The 12 VP federation tokens have two gray sides. Place the scoring board next to the game board. Randomly place one round scoring tile faceup on each numbered tile space of the scoring board. Return the unused round scoring tiles to the box. Randomly place one final scoring tile faceup on each tile space to the right of the green ranking tracks. Return the unused final scoring tiles to the box. Randomly select as many round boosters as there are players in the game plus three (e.g., seven round boosters in a 4-player game) and place them next to the game board. Return the unused round boosters to the box. 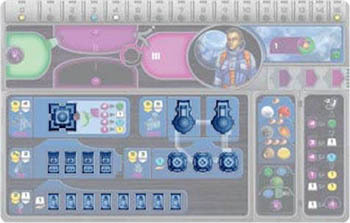 Place all action tokens, Gaia Planet tokens, the Lost Planet token, power tokens, Q.I.C., and record tokens near the game board as a general supply. The first player chooses one of the above factions and takes the matching faction board. Continuing in clockwise order, each other player chooses one of the remaining factions. Place your faction board in front of you with the chosen faction faceup. Take all structures and Gaiaformers of your color. Place the structures on their corresponding spaces of your faction board. Place your three Gaiaformers near your faction board. The Terrans' structures and Gaiaformers. Take one ore , one knowledge , and two credit markers and place them on the starting positions of your resource track. Return the unused ore, knowledge, and credit markers to the box. The Terrans start with 3 knowledge, 4 ore, and 15 credits. If your faction board shows at least one Q.I.C. below your name, take that many Q.I.C. from the supply and place them on your faction board. For each area of the power cycle on your faction board, take from the supply the number of power tokens shown and place them in that area. The Terrans place 4 power tokens in area Iand 4 power tokens in area II. Take six player tokens of your color and place one of them on level 0 of each research area on the research board. The Taklons start on level 0 in each research area. If your faction board shows level 1 of a research area, advance your token one level in the corresponding area. If that level shows a resource marked by a star and a white outline, gain that resource immediately as a one-time bonus:. To gain ore, move the ore token that many spaces to the right on your resource track. To gain a Q.I.C., take a Q.I.C. token from the supply and place it on your faction board. To gain a Gaiaformer, take one of your set-aside Gaiaformers and place it on your faction board. Note: The level 1 bonuses of the "Economy" and "Science" research areas are income bonuses and are not gained during setup. 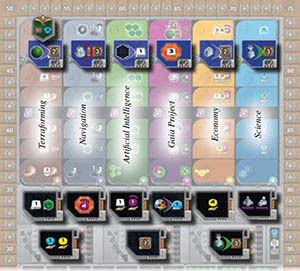 The Terrans' faction board shows level 1 of the "Gaia Project" research area; they advance 1 level and gain 1 Gaiaformer. Take the seventh player token of your color and place it on space 10 (10 VP) of the VP track as a VP marker. Take all satellites of your color; place one on each "0" space on the scoring board and the rest near your faction board. Take one player aid and place it faceup near your faction board. If you are playing the Taklons, take the brainstone and place it in area Iof your power cycle. If you are playing the Gleens, take the Gleens' federation token and place it near your faction board. 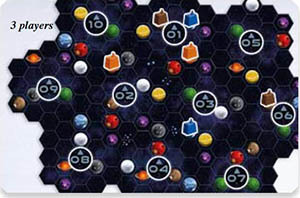 If you are playing the Ivits, take the six space stations and place them near your faction board. For your first game, place your mines as shown below. Always By placing your first structures, you colonize your first planets, take your mines from left to right on your faction board. and you reveal spaces on your faction board. This is important for your income. Starting with the last player and continuing in counterclockwise order, choose an available round booster and place it faceup in front of you. Unchosen round boosters will remain next to the board and be available for the first round. When playing with 1 or 2 players, a neutral player is added to affect final scoring. Take two satellites of an unused color and place one on each ranking track next to the final scoring tiles; the number on each final scoring tile determines the satellite's position on that ranking track. During final scoring, these satellites count as a neutral player at the appropriate rank. Return all unused satellites to the box. In a 2-player game, a neutral satellite is placed on space 8 of the ranking track next to this tile. 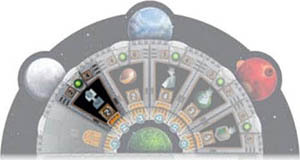 Return all unused faction boards, structures, Gaiaformers, player tokens, satellites, ore markers, knowledge markers, credit markers, player aids, the brainstone, the Gleens' federation token, and space stations to the box. Return the turn order card to the box; it is used only when playing with variable turn order. Variable turn order is an advanced rule. At the end of the game, the player with the most VP wins. You will gain VP during the game as well as at the end of the game. Track your VP using your marker on the VP track. The various ways to gain VP are detailed below. Six round scoring tiles are placed on the scoring board during setup, one for each round. Each round, you gain VP when you take the action shown on the tile. Each time you advance in any research area during this tile's round, gain 2 VP. Two final scoring tiles are placed on the scoring board during setup. At the end of the game, players gain VP depending on how well players fulfilled those conditions. 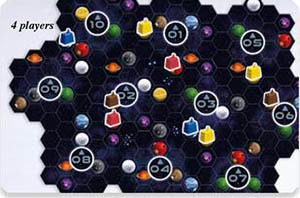 Next to the final scoring tiles are two ranking tracks; during the game, use the satellites on them to track players' progress on the scoring conditions of the final scoring tiles. At the end of the game, the highest ranked player gains the most VP, and other players gain fewer VP according to their ranking. This final scoring tile rewards colonizing as many Gaia Planets as possible. Each time a player colonizes a Gaia Planet, move her satellite one space higher on the track. By uniting planets to form federations during the game, you gain federation tokens which can award you VP and additional resources. When a player gains this federation token, that player immediately gains 6 VP and 2 knowledge. Both types of tech tiles (standard and advanced) can award you VP as well as allow you to advance in a research area. This standard tech tile gains you 3 VP each time you colonize a Gaia Planet. During the game, power will cycle through three numbered, connected power areas on your faction board. Charging power will allow you to move power tokens toward area III, and spending power in area III will move it to area I. To the left of the three power areas on your faction board is the green Gaia area, which interacts with your power cycle. The Hadsch Hallas' power cycle after setup. You will need to charge power before you can spend it. Effects that allow you to charge power are represented by an icon like the one to the right. If there is at least one power token in area I, move a power token from area Ito area II. If area Iis empty, move a power token from area II to area III. If areas Iand II are empty, you cannot charge the power. An effect allows you to charge 4 power. To do so, you first move a power token from area Ito area II. Since area Iis now empty, you move 2 power tokens from area II to area III. Now areas Iand II are both empty, so you cannot charge any more power. Some actions require you to spend power. You can spend only power tokens that are in area III. To spend power, move it from area III to area I. An action requires you to spend 2 power, so you move 2 power tokens from area III to area I. The total number of power tokens in your power cycle can change over the course of the game as effects allow you to gain or discard power. To gain power, take power tokens from the supply and place them in area I. Effects that allow you to gain power are represented by icons like the one to the right. To discard power, take the power token from your faction board and return it to the supply. Unless specified, you can discard power tokens from any combination of areas except the Gaia area. An effect allows you to gain 1 power. To do so, you take 1 power token from the supply and place it in area I. Then you discard 2 power for another effect by taking 2 power tokens from among your power areas and returning them to the supply. At the beginning of each round (including the first), income allows each player to gain resources. Income is represented by the icon to the right. Your faction board, your round booster, your tech tiles, and your current level in each research area on the research board can all allow you to gain income. Track your ore, knowledge, and credits using the corresponding tokens on the resource track of your faction board (as you gain or lose a resource, move the token to the number you have remaining). The track ends at 15, so you cannot have more than 15 ore, 15 knowledge, and 30 credits (15 per token). The Hadsch Hallas gain 1 ore and 1 knowledge. You choose the order in which you charge and gain power. When you gain income from a source (a single income icon), you must take it all at once before taking the income from another source. You can choose to charge 4 power first and then place a new power token in area I, or vice versa. If you have power tokens in the Gaia area on your faction board, move them to area Iof your power cycle (in the direction of the arrow). 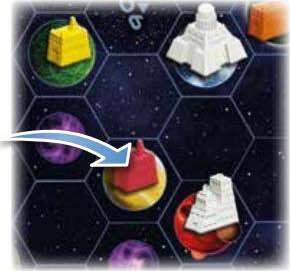 Exception: The Terrans move the power tokens directly to area II instead of area I of the power cycle (as shown by the arrow on their faction board). If you have a Gaiaformer on a Transdim Planet, place a Gaia Planet token on that planet. From now on, that planet counts as a Gaia Planet. The Gaiaformer remains on the Gaia Planet until you build a mine on that planet. During the Gaia phase, a purple Transdim Planet with a Gaiaformer transforms into a green Gaia Planet. Starting with the first player and continuing in clockwise order, players take turns taking a single action. This continues until all players have taken the "Pass" action. As soon as a player has passed, that player does not take any more turns for the rest of the phase. The phase ends when all players have passed. Except for passing, most other actions can be taken multiple times during the same phase (but only one action per player turn). You will choose the "Pass" action exactly once during the round, thereby ending your participation in the round. During your turn, you can take free actions immediately before or after your action. During other players' turns, you can charge power when your opponents take actions that trigger your passive action: charge power. You can build a mine on a planet, thereby colonizing that planet. To build a mine, you must spend two credits and one ore (this cost is shown to the left of the mines on your faction board). You must have at least one mine on your faction board in order to build a mine. You can build a mine only on a planet that meets these conditions: It is empty (i.e., has no structures on it). It is accessible from one of your planets. It is habitable to your faction. If the planet is not habitable, you must pay any costs required to make it habitable. If these conditions are met and you have paid all necessary costs, take the leftmost mine structure from your faction board and place it on the planet. You must complete this action in its entirety, and you can take it only if you pay all of the necessary costs immediately. You cannot take only part of the action, like terraforming the planet partially, or terraforming the planet but not building a mine. There are special rules for building a mine on a Gaia Planet with a Gaiaformer on it. These are explained at the end of this section. A planet's accessibility is determined by your progress in the "Navigation" research area. When your token is on level 0 or 1, your basic range is one. This means that you can build a mine only on a planet that is one space away from (directly adjacent to) a planet you have colonized. At levels 2 and 3, your basic range is two, at level 4 your basic range is three, and at level 5 your basic range is four. To determine the needed range, choose the shortest path from one of your planets to the intended planet. The path can cross planets, whether or not they are colonized. Range always defines your maximum range; you can colonize planets that are closer than your maximum range. Additionally, when choosing a planet to build a mine on, you can spend any number of Q.I.C. to increase your range by two spaces for each Q.I.C. spent. Gaia Project includes ten different planet types. Only one type- the respective type of each faction's home planet-is habitable to that faction. The color of your faction board corresponds to the color and type of your home planet. Transdim Planets cannot be built on. However, you can transform a Transdim Planet into a Gaia Planet using a Gaia Project. Gaia Planets can be made habitable by paying one Q.I.C. Your home planet type has no impact on this cost. The cost to make a Gaia Planet habitable is shown on your faction board. The planet is considered accessible to that faction. You do not need to pay the Q.I.C. cost to make the planet habitable. After building a mine on the planet, return the Gaiaformer to your faction board. The seven colored planet types must first be terraformed. Depending on how similar the habitat conditions of the planet are to your home planet, this process can take one, two, or three terraforming steps. Your faction board shows the required number of terraforming steps to make each planet type habitable to your faction. You must spend a specific amount of ore for each terraforming step. The ore cost is determined by your progress in the "Terraforming" research area. When your token is on levels 0 or 1, each terraforming step costs you three ore. At level 2 the cost is two ore per step, and at levels 3 and beyond the cost is one ore per step. The Geodens are at level 3 in "Terraforming", so they must pay only 1 ore for each terraforming step. Some power actions and special actions provide free terraforming steps. When taking these actions, do not pay the cost of those terraforming steps. If those steps are not enough to make a planet habitable, you can spend ore to perform additional steps. The Geodens take a special action that provides 1 free terraforming step, however they need to take 2 terraforming steps to make the brown planet habitable. Since they are at level 3 in "Terraforming", the Geodens pay 1 ore to take the second step. The Lost Planet is the last planet type, and is only discovered by reaching level 5 of the "Navigation" research area. Have access to a Transdim Planet without a Gaiaformer on it. A Gaiaformer that is on one of the three spaces of your faction board is available to you. You gain your first Gaiaformer when you reach level 1 in the "Gaia Project" research area; take one of the Gaiaformers you set aside during setup and place it on one of the spaces on your faction board. You gain a second Gaiaformer when you reach level 3, and a third when you reach level 4. A Gaiaformer will stay on the transformed planet after the Gaia project finishes. You cannot use Gaiaformer to start a new Gaia Project until you build a mine on its planet to return it to your faction board. The accessibility of a Transdim Planet follows the same rules as the "Build a Mine" action. 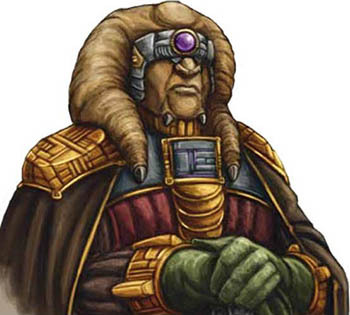 A planet with a Gaiaformer does not count as colonized by the faction owning that Gaiaformer; therefore, that planet cannot be used as a "starting point" to access another planet (Transdim or otherwise). 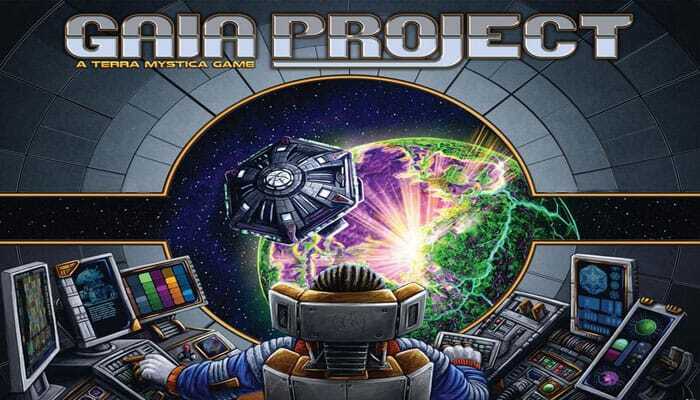 To start a Gaia project, you must move a total amount of power from areas I, II, or III to your Gaia area; the amount is determined by your progress in the "Gaia Project" research area. When your token is at level 1 or 2, the cost is six power per Gaia Project. At level 3, the cost is four power, and at level 4 or 5, this cost is three power. The cost is the same for all of your Gaiaformers, regardless of when you gained them. The Terrans have gained 2 Gaiaformers. To start a Gaia Project, they must move 4 total power tokens from areas I, II, or III to their Gaia area. Since Gaia Projects are completed in the following round, any Gaia projects you begin in the final round will never be completed. You can upgrade your structures (including your starting mines) one step at a time to gain new resources and other advantages. Only mines can be placed directly on empty planets; all other structures are upgrades that replace another structure on the game board. The connections between different types of structures on your faction board are a reminder of how different structures can be upgraded. When you upgrade a structure, remove the original structure from the board and place it in the appropriate row of your faction board from right to left. Like mines, trading stations and research labs are taken from left to right from your faction board. To upgrade a structure, you must spend ore and credits. The cost to upgrade to a structure is shown on the left side of the corresponding structure row on your faction board. Upgrading a mine into a trading station costs six credits and two ore. If there is at least one opponent's structure in the neighboring area of your mine, this cost is reduced to three credits and two ore. The neighboring area of a mine consists of all spaces within a range of two spaces. Upgrading a trading station into a planetary institute costs six credits and four ore. As soon as you upgrade to your planetary institute, your faction gains a special ability or action space that is unique to your faction. The various planetary institutes are explained in appendix I on page 20. Upgrading a trading station into a research lab costs five credits and three ore. When you upgrade to a research lab, you immediately gain one tech tile (see right column). Upgrading a research lab into an academy costs six credits and six ore. As you upgrade, decide which of the academies on your faction board to upgrade to. One academy grants you an income of two knowledge each round, and the other academy gives you an action to gain one Q.I.C. When you upgrade to an academy, you immediately gain one tech tile (see right column). You can take any standard tech tile, except one you already own. No faction can own more than one of the same tech tile, even if it is covered by an advanced tech tile. If you take one of the six tech tiles directly below a research area, you can advance only in the research area above it. If you cannot advance any further in that research area, you do not advance. If you take one of the three tech tiles in the lower row, you can advance in the research area of your choice. Your player token must be on level 4 or 5 of the research area from which you wish to take the advanced tech tile. You must own at least one federation token with its green side faceup. To take the advanced tech tile, flip one of your federation tokens to its gray side. You must have at least one uncovered standard tech tile. When you gain an advanced tech tile, place it faceup covering one of your standard tech tiles. A covered tech tile has no effect. A standard tech tile can "hold" exactly one advanced tech tile. You cannot replace an advanced tech tile with another advanced tech tile. Advanced tech tiles are not refilled. Only six advanced tech tiles are available each game. With this action you can form a federation comprising several of your colonized planets. Forming a federation allows you to gain a federation token of your choice from the supply. You can form any number of federation during the game as long as you meet their requirements. You can form a federation only with planets you have colonized. Mines have a power value of 1. Trading stations and research labs have a power value of 2. Planetary institutes and academies have a power value of 3. The power value of each structure is also shown under the structure's cost on your faction board. To form a federation, you must connect the necessary planets. Planets you have colonized that are directly adjacent to each other are connected. To connect planets that are not adjacent, you must immediately build satellites. To build a satellite, discard one power. Then take one of the satellites near your faction board and place it in a space adjacent to either one of your colonized planets or one of your satellites. Satellites cannot be placed on planets. 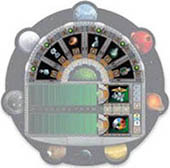 A space can hold up to one satellite of each player color. You can build as many satellites as you need to connect the necessary planets. You must connect all of the necessary planets during a single action. When you form a federation, take a record token from the supply and place it on any planet in that federation as a reminder of the federation. If you built any satellites when forming the federation, you do not need to place a record token. When you form a federation, gain one federation token of your choice from the supply, placing it in front of you with its green side faceup. When you gain a federation token, you immediately gain everything shown on the token. This will usually include VP and resources. Note: There is one type of federation token that awards 12 VP and nothing else. These tokens are gray on both sides, and are placed with either side faceup when you gain them.. When you gain this federation token, you gain 6 VP and 2 knowledge. Later, you will be able to flip it over to gain an advanced tech tile or advance to level 5 of a research area. You can later flip tokens from their green side to their gray side to gain an advanced tech tile or advance to the highest level (level 5) of a research area. You choose the planets to form a federation, as long as your structures have a total power value of at least seven. In other words, you can choose planets that are farther away, as long as those planets are needed to have a total power value of at least seven. You cannot form a federation by connecting more planets and satellites than are needed to form it. In other words, if the federation would be valid with at least one fewer planet and one fewer satellite, you must change the federation. Each planet and satellite can be part of only one federation. When colonizing planets directly adjacent to one of your federations, these new planets enlarge the existing federation without any advantage for you. Connecting two federations by colonizing a connecting planet has no effect. The connected structures must have a total power value of at least seven. Connect structures with as few satellites as possible. Build satellites by discarding power. Planets and satellites of the newly formed federation cannot be directly adjacent to planets or satellites from any of your existing federations. Spend four knowledge to advance one level in a research area of your choice. If that level shows a resource marked by a star and a white outline, gain that resource immediately as a one-time bonus. Any other effect of that level is active immediately, and remains active as long as you are at that level. In order to advance to level 5 of a research area, in addition to any other costs, you must flip one of your federation tokens from its green side to its gray side (this is the same cost as for taking an advanced tech tile). Only one player can advance to level 5 of each research area. Each time your research token advances from level 2 to level 3 in any research area, you charge three power (this also applies if you advanced by taking a tech tile). The icon between level 2 and level 3 of a research area is a reminder to charge 3 power when you advance past it. At the end of the game, you will gain 4 VP for each level 3, 4, and 5 you have reached or passed on the research board. The lower part of the research board shows octagonal purple and green action spaces. To take a power action (purple spaces), spend the indicated amount of power. To take a Q.I.C. action (green spaces), spend the indicated number of Q.I.C. After paying the action's cost, resolve the effect shown. The effects of action spaces are explained in appendix on page 23. Each power and Q.I.C. action can be taken only once per round. After you take a power or Q.I.C. action, place an action token onto the action space to show that the action cannot be taken again during that round. Special action spaces are octagonal orange spaces that can be used for an immediate effect. Unlike power and Q.I.C. actions, special actions have no cost and are available only to the player that owns the component they appear on. Special action spaces appear on faction boards, tech tiles, and round boosters. The Ivits can use this special action once they have upgraded to a planetary institute. Only the player with this round booster can take this action. Each special action can be used only once per round. After you take a special action, place an action token onto that action space to show that the action cannot be taken again during the current round . A special action cannot be combined with another special, power, or Q.I.C. action. The special action spaces are described in the appendices based on the component they appear on. On your turn, if you cannot or do not want to take any other actions in the current round, you must pass. After you pass, your turn ends, and you do not take any more turns for the remainder of the round. When you pass, take one of the three available round boosters (including one that another player returned during this round), then return the booster you started the round with. You cannot keep your booster (i.e., you cannot use the same booster two rounds in a row). In the final round, do not take a new booster before returning yours. Place the new round booster facedown in front of you to show that you have already passed. Once all players have passed, the action phase of the current round ends. Some round boosters have effects that trigger when you pass, indicated by a red icon. These effects trigger during the round you return that booster. Some Tech tiles also show that icon; those effects trigger every time you pass. After returning your round booster, you take another booster and place it facedown in front of you. These effects trigger when you pass. The first time a player passes during a round, that player takes the first player marker. In addition to your action, you can also take any number of free actions during your turn. You can take free actions before or after your action, but not during. You can take each free action as many times as you can afford to. You can take free actions before you pass but not after (passing is an action). You cannot take a free action if it is not your turn (e.g., if you already passed, during a passive action, during a different phase, etc).. Spend 4 power to gain 1 Q.I.C. Spend 3 power to gain 1 ore. Spend 1 Q.I.C. to gain 1 ore. Spend 4 power to gain 1 knowledge. Spend 1 power to gain 1 credit. Spend 1 knowledge to gain 1 credit. Spend 1 ore to gain 1 credit. Spend 1 ore to gain 1 power (in area I). The summary on the right side of your faction board shows all exchange possibilities. Each time a player builds a mine or upgrades a structure, each other player with at least one structure in the neighboring area (within a range of 2 spaces) may spend VP to charge power. To charge power for a structure, spend one fewer VP than the power you would charge (to charge 1/2/3/4 power you must spend 0/1/2/3 VP). You may choose not to spend any VP, and thus not charge any power. If you own multiple structures in the neighboring area, you can charge power only for your structure with the highest power value (power value is explained on page 14). If you own multiple structures with the same power value, only charge power for one of them. The Ivits (red) build a mine, so the Xenos (yellow) and Itars (white) can spend VP to charge power. The Xenos spend 0 VP to charge 1 power for their mine. The Itars' planetary institute has their highest power value, so they can spend 2 VP to charge 3 power. You cannot spend fewer VP to charge less than the full amount of power. You must either charge all of the power or none of it, with two exceptions: If you cannot charge all of the power because it is more than you would need to move all of the tokens in your power cycle to area III, you charge only as much as you can by spending the corresponding number of VP. The Itars can charge only 1 power, even though the planetary institute would allow them to charge 3. They spend 0 VP to charge 1 power. If you cannot spend the necessary VP because you do not have enough, you spend as many as you have and charge the corresponding amount of power. The Ivits can afford to spend only 1 VP. Even if their structure would normally allow them to spend 2 VP to charge 3 power, they may choose to spend the 1 VP they have to charge 2 power. The player who builds or upgrades must point out which opponent(s) can charge power. In clockwise order from the player who built or upgraded, players decide if they want to charge power. An opponent that has passed can still charge power. You must spend VP only for power you charge this way. You do not have to spend VP for any other power you charge. The CLEAN-UP phase prepares you for the next round. At the end of round 6, skip this phase and proceed to scoring. Remove all action tokens from all power, Q.I.C., and special action spaces and return them to the supply. Flip all round boosters faceup. Remove this round's round scoring tile from the scoring board and return it to the box. After this phase ends, the next round begins. The game ends after round 6's action phase. It is followed by a final scoring. The highest-ranked player gains 18 VP. The second-highest gains 12 VP. The third-highest gains 6 VP. The fourth-highest gains 0 VP. In case of a tie, for each tied player, add the VP for the highest remaining rank. Divide the total points evenly among those players. Example: Two players share the highest rank: they add the VP for the highest and second-highest ranks together and divide them evenly (18+12=30 VP; each of them gains 15 VP). Owns the most structures that are part of federations (the Lost Planet's mine counts as a structure). Owns the most structures (the Lost Planet's mine counts as a structure). Colonized the most different planet types (including Gaia Planets and the Lost Planet). Colonized the most Gaia Planets. Colonized in the most space sector tiles (at least 1 structure per sector, including the Lost Planet). For each level 3, 4, and 5 you have reached or passed on the research board, gain 4 VP (e.g., at level 5 in "NAVIGATION", you gain 4+4+4=12 VP). Reminder for VP in each research area at the end of the game. Gain 1 VP for every 3 credits, knowledge, or ore you have (in any combination). The player with the most VP wins the game. In case of a tie, the tied players share the victory.